Springfield Before the showing of “The Organizer,” the organizers of the screening and Q&A has put together a small dinner for some of the professors and their star students. As people put away their plates, Rick Paar, a Springfield College psychology professor, said that since I was there he wanted to tell the story of how I got him arrested almost 49 years ago. I was all ears. I knew that about 50 members of the Springfield College Black Students Union had gotten arrested for joining the welfare rights members after they had voted for the students to leave and for the police to arrest them, but I didn’t really appreciate that the rush of the police into the demonstrators might have caught some other white supporters as well. Paar told the story from the perspective of a 19-year old Springfield College student caught in the drama of the day. 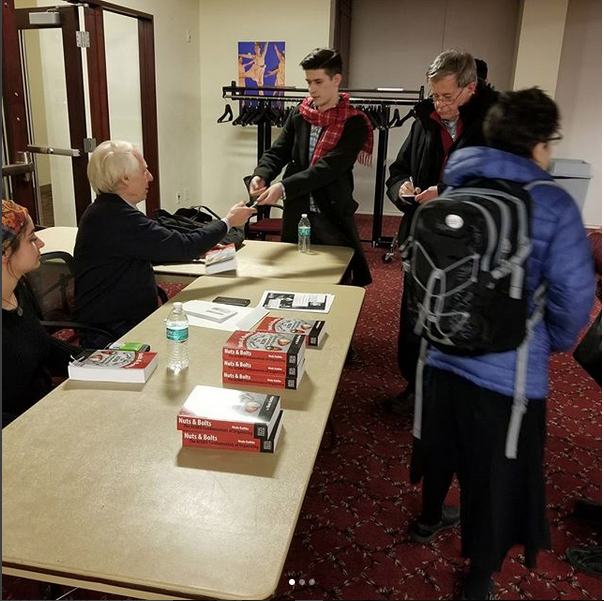 He had been at the Vietnam Moratorium Day rally in downtown Springfield that day in Court Square, and like many others, including the students of all four area high schools that were then built cheek to jowl at the bottom of the hill. At the time there was a bus strike so everyone was making their way up the hill. At the top was the Springfield Welfare office housed in a former supermarket in this largely African-American neighborhood across from Springfield College. Paar mentioned having heard Barbara Rivera, the chair of the North End WRO, our delegate to the rally, speak about ending the war on the poor as well, and call for support for our demonstration and sit-in at the welfare office. The confluence of all of these events, coupled with the police action, was combustible, and a riot broke out. Long and short, he was caught in the sweep with some of his buddies from school by the police. He told about the bottles flying, which I also remember clearly from my trip to jail. He felt safer in the paddy wagon. In a side bar he mentioned seeing his father, who was then a college professor, trying to pull a coat over his head while he let air out of the tires. Eventually, we all ended up in the York Street jail, which is now where the NBA Hall of Fame is located after the jail was demolished. My friend, Dan Russell, mentioned I can now say I was in the Hall of Fame. Anyway, Steve Bardidge, the MWRO lawyer, had always told me he was able to negotiate my arrest down from an inciting to riot charge to simple a nolo contendere plea on simple protest with a 2-year probation because he was able to get me packaged into a deal being demanded by an influential Springfield College professor who was trying to spring his son. Now, almost 49 years later, I discover that was Rick Paar’s father. He ended the story before the documentary began, saying “You can thank me now, Wade.” And, I did, and here it is again, “Thanks, Rick!” Better late than never. This entry was posted in Ideas and Issues and tagged Nuts & Bolts, Rick Paar, Springfield College, The Organizer by Wade. Bookmark the permalink.